Black vintage snake and leather wearable art clutch with shoulder strap. 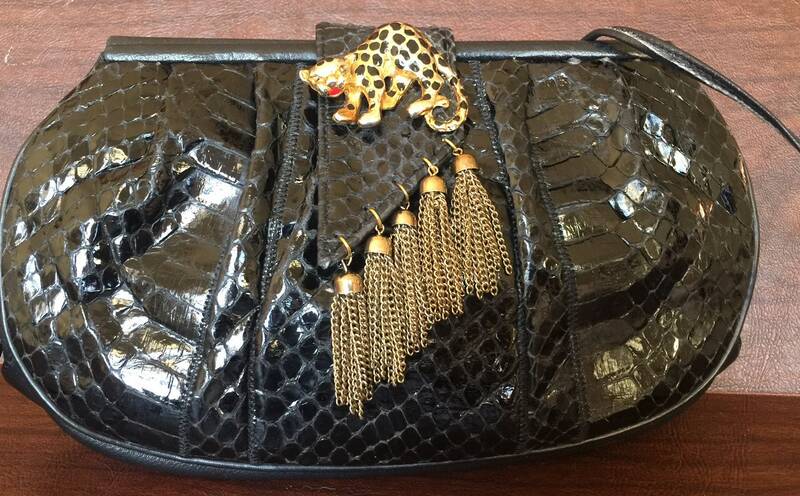 Embellished with brass tassels and a vintage leopard cat with rhinestone eyes. Lightly worn; one of a kind. 9.5” x 5.5” x 2”. Detachable brass Dressed Up Cat tag. My handbags and other accessories are fashion that’s “re-fashioned”, coming from my fast stash of "found" and vintage purses and other “odd” components I’ve collected from here, there and everywhere. The handbags usually tell a story—often funny, and sometimes downright sarcastic. I have such fun seeing shapes, forms, and textures evolve into special pieces that say something to--and about--the women who carry them. I like working on leather bags with a lot of remaining “life” and my other components can be from old house wares, discarded feather boas, broken costume jewelry and wood or stone carvings. I started this project years ago, purely for my own amusement, but it took on a life of its own. I distinctly remember the first time a total stranger said to me “I LOVE that bag—where did you get it?” My handbags have since been sold in boutiques, art galleries, craft shops and art fairs. They are great for starting a conversation in a room full of strangers. I continue to be fascinated by a handbag’s innate ability to unite women across age, geographic and cultural boundaries. I’ve taken a hiatus, but my collection of “this and that” has been waiting (somewhat) patiently in my closet. Actually, it’s been a series of closets. But the creative itch is back, and I'm delighted to again offer my bags and other treasures exclusively here on Etsy. Please enjoy!